Consistently named as one of the top cities in the world with its breathtaking mountain backdrop, gorgeous cityscape and fantastic culture, Vancouver is a major tourist destination offering visitors a wide variety of indoor and outdoor pursuits. Adding to Vancouver's world-class status, the city hosted the 2010 Olympic and Paralympic Winter Games with over 2 million guests in attendance. No doubt about it, Vancouver is a beautiful city! Check out the video and see for yourself! Cradled amid sky-scraping mountains and sparkling ocean, scenic Vancouver is one of the world’s premier meeting and convention destinations. World-renowned cuisine, luxury hotels and unique venues – including the two time winner of “World’s Best Convention Centre” – all add up to an unforgettable conference experience. Visitors experience a modern, cosmopolitan city that blends culture and landscape. With so much to experience in Vancouver, you will be well-entertained during your conference off time. Galleries and public exhibits for art enthusiasts, historical sites and districts for history buffs, and scenic hiking trails and botanical gardens for nature lovers are just a small sampling of the city’s diverse attractions. WHERE IN THE WORLD IS VANCOUVER? Almost exactly halfway between Europe and the Asia Pacific region, Vancouver is on the west coast mainland of North America. It is in the southwest corner of British Columbia – the westernmost of Canada’s 10 provinces and three territories. Metro Vancouver, covering 2,930 square kilometres (1,130 square miles) and home to more than two million residents, comprises 24 local authorities, one of which is the City of Vancouver. Bordered on its northwestern edge by spectacular Stanley Park – one of the continent’s largest downtown green spaces – Vancouver’s compact city centre is surrounded on three sides by water, with Burrard Inlet to the north, False Creek to the south and English Bay to the west. Several nearby neighbourhoods radiate from this downtown core, including Gastown, Chinatown, Yaletown, the West End and Granville Island. Nearby East Vancouver encompasses the Main Street and Commercial Drive communities while the West Side features beach-studded Kitsilano. Easy to navigate, Vancouver's main thoroughfares generally follow a user-friendly grid pattern: streets run north to south and avenues run east to west. The avenues, for the most part, are numbered – 1st, 2nd, 3rd, etc. – and the streets are named. Broadway is the main exception to the avenue numbering rule – it should be 9th Avenue. The entire list is to long for this space! Not only do we think Vancouver is a spectacular place to visit, others do to! The following list is the just the awards Vancouver has been honoured with in 2013. Baxter Travel Media– Agent Choice Award for Top City/Town in Canada (2013). In Baxter Travel Media’s annual awards, voted on by Canadian travel agents, Vancouver was named the top city in Canada. In Travel + Leisure’s annual "World's Best" awards, Vancouver was ranked #9 on the list of top cities in Canada and the U.S.
Vancouver’s 1,000 acre Stanley Park was included on Travel + Leisure magazine's list of world’s most beautiful city parks. Vancouver was named one of National Geographic magazine's "Top 10 Beach Cities" alongside Sydney, Honolulu, Barcelona, Rio, Nice, Cape Town, Miami, Tel Aviv and Santa Monica. For the fourth year in a row, Vancouver International Airport (YVR) was named Best Airport in North America. YVR also ranked eighth worldwide – the only airport in North America to land in the top 10. After winning the World Wildlife Fund’s (WWF) Green City Challenge Award, Vancouver was named the world’s first Global Earth Hour Capital. The city also came out on top in the People’s Choice category, thanks to online votes cast from around the world. The WWF commended Vancouver’s commitment toward climate change, as well as its holistic and strategic approach to climate action, support for local food and progressive neighbourhood energy plan. In this year’s Readers’ Choice survey published in M+IT magazine’s Annual Market Report, Tourism Vancouver was named by Canadian MICE planners as one of the top Canadian CVBs to exceed their expectations. B.C.‟s biggest metropolis has been a hotbed of sustainability for decades, befit-ting the home of one of the world‟s largest urban parks and the historic spot where Greenpeace was founded. Already recognized as having the smallest carbon footprint of any major city in North America, Vancouver mayor Gregor Robertson recently committed to making this “the world‟s greenest city” by 2020. The initiative covers issues of sustainability, livability and urban planning for residents and businesses and aims to implement programs that will make Vancouver an Eco-pioneer and green beacon for communities around the world. Vancouver is Canada’s greenest city, according to a 2011 report by the Economist Intelligence Unit. The study, which also placed the city second in North America after San Francisco, praised Vancouver’s low carbon emissions, high number of LEED-certified buildings and the city’s extensive “greenest city” action plan. OCEAN WISE: Seafood is a Vancouver dining specialty, but not all aquatic dishes are created equally. Pioneered by Stanley Park‟s Vancouver Aquarium and by innovative chefs across the region, the popular Ocean Wise (www.oceanwise.ca) initiative supports sustainable fishing practices, ensuring that the seafood on your restaurant table has been raised, sourced and supplied in an environmentally sound manner. GREEN TRANSPORTATION: Vancouver‟s commitment to green transportation is exemplified by the region‟s growing mass transit system. The original SkyTrain line opened in 1985, with a new line added in 2002. In 2009 – just in time for the 2010 Olympic and Paralympic Winter Games – the Canada Line was opened, linking the airport to down-town in a short, 25-minute trip. The next stage of this Eco-minded transit network will be the Evergreen Line, scheduled to open in 2016. But the city‟s green transport credentials are not just transit-related. Vancouver has one of the world‟s largest hybrid vehicle taxi fleets and has recently expand-ed its commitment to cyclists by creating popular new downtown bike lanes on city centre streets. Car drivers have not been forgotten, though: the city now re-quires electric vehicle charging stations for 20 percent of all parking stalls in new condo buildings. 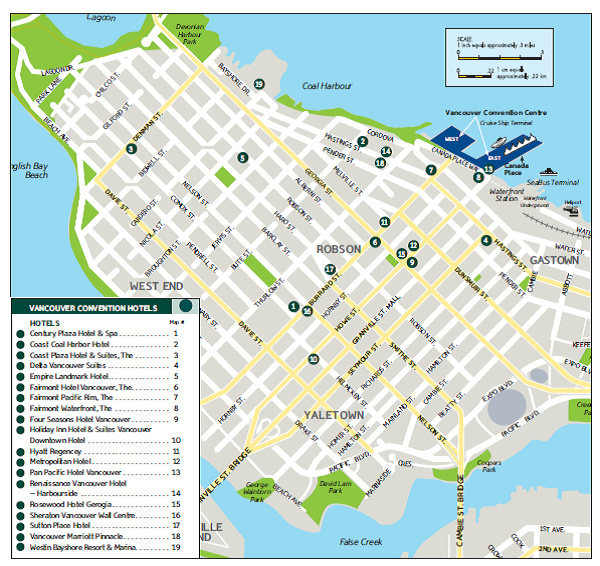 STAY GREEN: Vancouver has a host of hotels designated under the global Green Key Eco-Rating Program as exemplifying great environmental stewardship. Only a few dozen hotels around the world have the coveted top-level Five Green Keys rating and in Vancouver including the Symposium venue, the Fairmont Waterfront (www.fairmont.com/waterfront). As part of its commitment to environmentally sustainable practices, the Fairmont Waterfront sources herbs from its own rooftop garden, which also includes a honeybee apiary. Held every five years, the aim of the Symposium is to encourage the continuous improvement of highway geometric design.This event focuses on the latest breakthrough practices relating to highway engineering in their different life phases, including daily operational effects and safe highway designs.